Are your kids home from school for winter weather school closures and now you’re looking to make plans to entertain them on a cold, snowy, or a cold and snowy day? Many cities have a variety of outdoor winter activities to enjoy and keep your family busy if you’re willing to make a plan and venture out into the cold. As the bitter cold grips many parts of the nation each January and February, figuring out how to participate in outdoor activities from snowshoeing to skiing with young children while remaining safe and warm can create a challenge for parents, especially when the temperature drops below zero. The challenges can be met with some simple tactics and good decisions that allow you and your family to get out there to enjoy wintertime activities; even making family bonding memories on the slopes. Living in Minnesota makes snow days and skiing a reality for my family, but the brutal cold conditions need to be resolved with a cold-day plan. Our travel plans for a family ski trip to Lutsen Mountain along Lake Superior in northern Minnesota happened to fall during Minnesota’s, subzero, January weather. Having a plan in place to combat the winter conditions was needed if we were going to enjoy spending time on the slopes over spending time sitting indoors. View looking down from the gondola at Lutsen Mountain Ski Resort; beautiful views. Steamboat Resort, Colorado, gondola on a snowy day over Christmas versus a day of cloud-cover on the Lutsen gondola in Minnesota. Young children don’t have the same abilities as an adult body to regulate temperature which must be considered when planning outdoor wintertime activities. Additionally, young children often have less body fat to aid in keeping warm or even warming back up once they’ve had exposure to cold environments. Caution needs to be taken by parents and caregivers to keep children warm and safe in cold weather, or low windchills, because avoidance by remaining indoors for many months won’t put you at exposure risks but it will make you and your family stir crazy! Ski vacations bring a smile to her face as we settled in for our first evening at the condo at Caribou Highlands. The sun was shining on the top of Bridge Chair. Sunny skies always make it a bit warmer on the slopes even when the mercury drops. Heading up the Uller Mountain double chair. Uller Mountain offers several intermediate runs along with green runs for beginners and a Bunny Hill for those just starting out. Living in Minnesota and enjoying wintertime outdoor activities is a must for my family, but not being a native of Minnesota, I sometimes find when the temperature outside drops to the negative side of zero I pretty much only want to plan for indoor activities with my family; mainly staying inside next to a fire. That’s not our reality since long, cold and very cold winters, last for months in this northern region and there’s no complaining as Minnesotans consider themselves strong and apparently winter-resistant. Minnesota has many wintertime activities to choose from including dog sledding, snowshoeing and winter carnivals. For anyone traveling into Minneapolis/St. Paul looking for winter adventures click the link above for some family-friendly activity ideas at the end of the post. A wood-burning fireplace in the ski-in/out condo at Caribou Highlands was perfect to warm up next to after a day on the slopes. I had to reach into my bag of survival knowledge to make our ski trip successful as sitting by the fire during cold winter days isn’t in my families repertoire. Honestly, I wouldn’t want to just sit-it-out and miss all the wintertime activities that Lutsen Mountain offers guests. Lutsen Mountain offers slope-side views of Lake Superior as it’s situated in the Sawtooth Mountains that line Lake Superior’s north shore. Lutsen Mountain is one of the northernmost ski resorts in the US and boasts having the longest vertical drop in the Midwest. Lutsen Mountain is also the largest ski resort in the Midwest and has three open ski hills with a variety of terrain and trails; several challenging slopes and many intermediate runs. The resort has a fair share of natural snow and some lake effect snow, plus snowmaking capability. From the Twin Cities, Lutsen Mountain is just under a four-hour drive directly north. Along the journey you’ll pass through Duluth, Minnesota, and start along Highway 61 North. There are several indoor stops that can be made along the way including Glensheen mansion in Duluth, maritime and train museums, art galleries and an aquarium. Split Rock Lighthouse can be seen just before entering Silver Bay and beautiful Lake Superior views line the trip along the highway. You’ll travel through the town of Gooseberry Falls, which, always reminds me of “The Bullwinkle Show”and Frostbite Falls, Minnesota, a town inspired from the “Icebox of the Nation” aka: International Falls, Minnesota. If you’re looking for scenic winter views than the trip up the North Shore of Minnesota, along with the views at Lutsen Mountain Resort, will be well-worth your time, cost and effort. Photographers will find endless inspiration and beauty to capture. SKIING IN MINNESOTA’S COLDEST WEATHER? Yes, I made a plan to travel even further north than the Twin Cities, Minnesota, in January, to travel to even colder temps where the expected daytime highs were plummeting to around -18F degrees with a hopeful warmup to 17F degrees and snow by the end of the trip. The first day was just too cold with windchills too extreme to even contemplate skiing with young children, but the resort wasn’t closed and there were a few skiers on the slopes; they were the heartiest of Minnesotans, you betcha. The irony of spending money for a fun, family vacation that includes the words “winter,” “subzero,” and “survival” doesn’t escape me, but I’m now a Minnesotan-of-sorts and this is the climate for which I live and must get-to-know the inner Antarctic penguin side of my personality that’s still in moderate protest of living in a subzero climate as it spent many early years growing up on the Hawaiian island of Oahu. Have you seen a Hawaiian penguin? Photo Op: Minnesota’s mountain top under the setting sky with Lake Superior views. First, I made a quick visit to Joe’s Sporting Goods in St. Paul, Minnesota, to purchase heavier base layers (long underwear) along with toe and hand warming packets to add to our mittens and ski boots. Second plan: Proper layering techniques. Once we made it up to Lutsen it was quickly apparent that the windchill would be adding to the struggles to keep warm during our ski holiday. We spent our first day off the slopes and ventured down to the lake for a short time. Lake Superior had a mist hovering over the top that I’ve never had the good fortune to experience before and it was breathtaking both from the cold and the beauty. Views of Lake Superior from Lutsen Lodge. We put on our base layer and topped them with a lighter, looser, pair of long underwear which allows a layer of warmth to be trapped. The layering process continued as we layered a cotton long-sleeved shirt over the two base layers, then a sweater, Turtle Fur neck rolls, our ski pants and jackets, balaclavas, wool ski socks with feet warmers tucked into our arches and Kombi mittens with Gortex; mittens work better than gloves to keep hands warm in the coldest of environments. Scroll below to read “Tips and Tricks” for detailed instruction on the various techniques I use to keep my family warm on the slopes. Terramar base layers: A bit too much packaging materials for such small packing items but they offer brilliant, wearable design. Base layers of long underwear are a must and combining base layers is an excellent option for extreme winter conditions. Base layers are sold in a variety of warmth levels from light to heaviest. In extreme winter conditions it’s best to use a heavy “warmest” layer against the skin and build out using the next layer as a “light weight” and “loose” level layer. The heat from your body will be trapped between the two layers and help to keep you warm. Select ski gear for the conditions as they are sold with temperature ratings. As a family, we invest in a set that offers the highest degree of warmth and also a light level for early winter and early spring skiing: We add, or remove, base layers as needed dependent on the conditions. HotHands can be used creatively for subzero and extreme winter weather or used as suggested. Creative HotHands hand packets to keep your UPPER BODY warm. If your ski jacket has the under arm zipper for cooling simply zip in a warming packet. You can also place the warming packet over the first base layer in the lower ac space of your arm. (That’s the spot at the elbow crease). * Warning*: Don’t use the warming packets directly on the skin of very young children as for some it will be too hot and cause burns. My eleven year old has no problem with the warming packets directly on his skin but my six year old needs a layer between the pouches and her skin. Mittens over gloves for warmer hands. Wear a high-collar sweater or zip-up over your base layers and under your ski jacket or coat. The full-zip is easier to get off kids when you take a warming break. Use an extra layer at the neck with a neck roll. Again, neck rolls are sold as heavy fleece or light synthetics. Balaclava NOT Baklava: My children never pronounce it correctly and people around us think they’re talking about needing a Greek dessert. You might need that too for carb energy to keep warm. Balaclava: You need one of these for subzero skiing or low windchills because it protects your face, including your nose, from the conditions. I can’t say it will keep you warm, but it will protect your skin and keep you warmer than going without. Balaclava with attached skull-cap style headwear for under your helmet. Helmets are not intended to be used with a hat. Skip the hat under your helmet and make sure it’s fitted correctly. Helmets should rest at the proper space above the eyebrow and should only be able to shift modestly side to side or back and forth. Most helmets will offer venting and when it’s extremely cold you can use the thin layer skull-cap to help keep your ears and head warmer if not attached to your neck roll, or Greek-style dessert. 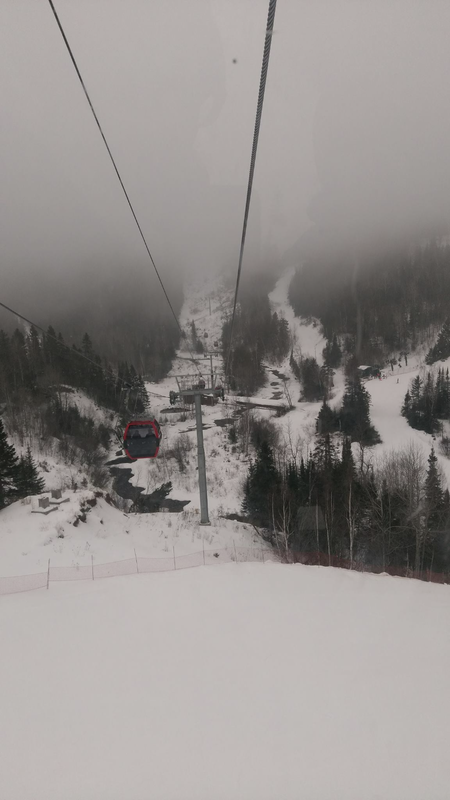 My Yetis: Lutsen Gondola connects two of the ski mountains and offers spectacular views of the resort trails, open water and Lake Superior. Finding a balance between your layers and ability to move comfortably is a challenge and it might have you feeling like your layered to the size of Big Foot. We found our success. We were packed-in our ski gear and still able to move around for our first day on the slopes. Slope-side: Looking over Lake Superior. Honestly, the worst of the process is having to move fairly quickly to get everything on and out the door before you overheat and begin to sweat. In this situation, sweating would not help the process of staying warm while skiing in subzero or extremely cold weather. Tip for parents: Have your layers stacked in layer-order for your kids to help the process move along at a tolerable pace. I also crack a window or a door to keep the room cooler. Our plan for the slopes was simple: We’d stop at the upper or lower chalet, or ski back to the condo to warm up whenever needed. Tip for parents: Sometimes kids can’t tell you if they’re getting too cold so it’s better to just plan to make the stops after every one, or two, trips down depending on where you’re skiing and the length of the run. Snow, trails and Lake Superior under blue skies: A frozen Bluebird Day. For our ski adventure it turned out that the appropriate layers and skiwear was sufficient to handle about four hours on the slopes before a warming stop. When we stopped for a break we shed our layers and were still warm underneath. The “Pink Bullet Kitty” as my son calls her. My daughter has two ski outfits because she has the motto of “One is never enough.” I purchase ski gear at the end of the season (discount and clearance pricing) in a size, or two, larger in the hopes for extra years of wear. Also, ski swaps are a great source of discounted ski gear. Surprisingly, we actually felt warm and stayed warm while skiing in some pretty extreme conditions and enjoyed a ski trip where we had the resort almost to ourselves. There were no lift lines and we didn’t have to worry about “bombers” which as a mother of two young skiers keeps me on alert as I follow behind my children on the slopes to provide cover like a hawk. Fresh powder on empty slopes; perfect! The snow report was accurate and we had a bit warmer weather and quite a bit of snowfall for two of the days. Proper planning and layering techniques allowed for us to make a lot of runs on fresh snow during some very cold weather. The ski trip was extremely enjoyable and goes on the books as a success. Are you ready for your outdoor wintertime adventures? Running water along Moose Return trail: I suggest avoiding this trail unless you’re looking for some great photos ops and a long-trek of practicing your Herringbone technique. Happy wintertime adventuring to all the brave adventurers and thank you for visiting Chasing Rockwell. Beautiful photography and interesting information! As a native from the Deep South, I cannot fathom such cold weather! Thank you! Living in Minnesota has been a learning experience for me and it’s taken many years to find the beauty. We really did! Thank you! The first day at -18F we skipped the slopes and opted to just visit down at the water but really the discernible differences between -18 and -6 are pretty much just versions of the same “extremely cold” commentaries. I was really surprised that the sun, low winds and layers really allowed for feeling warm out there on “bit warmer” day. Ski gear has come a long way! I even saw heated, battery powered base layers on clearance today so if anyone wants to battle Antarctic skiing-weather conditions that’s the next solution on my list! 😂. Thanks again Marcus for sharing! Thank you. I love suggestions!! I just looked up some quick information and Kerala looks STUNNING!!! It is very much now on my list. Thank you for your kindness to share! India remains a place of dreams for me in beauty, spirituality and people. Good meeting you!